On a sunny but cold day twenty one ramblers assembled at the Breastworks in Stranraer before boarding the Portpatrick bus for a leisurely start to what proved to be a most exhilarating day. Jack, Cath, Frances, Audrey, Jim, John McGoogan and his neighbour, Yvonne (nurse, can only walk alternate Saturdays), Jacqui, Sue, Duncan, Irene, Debbie, ‘arry, Mary Sloan, Jane (new, Munro walker) and a man from Portpatrick who is also a Munro walker! We caught the bus at Port Rodie and Leslie got on at Lochans to many cheers! The bus turned off to drive down Heugh Road, turning round on the edge of the golf course – he picked up no-one and no-one got on! He returned to the main road and drove down into the village where we all got off and met Linda and Allan. The harbour bore its picture postcard outfit in the brilliant and clear light of the morning and as the bus took the company along the Portpatrick road the sight of lambs gambolling in the fields really gave a foretaste of a spring soon to be with us. 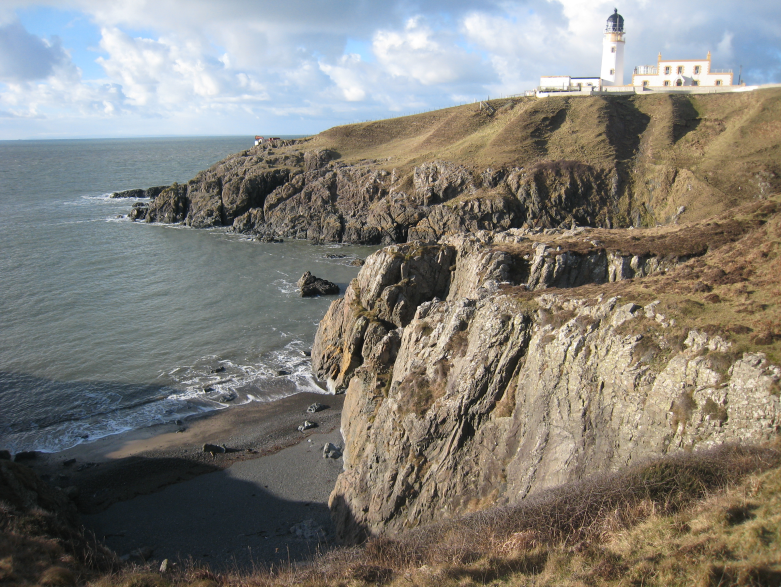 Walking started in earnest with the steps up to the Portpatrick Hotel, along the Southern Upland Way. This hotel looks over the north end of the village, built to a design by J.K. Hunter for Charles Orr Ewing, laird of Dunskey estate, in 1901. An early rest was taken after this exertion to watch the coastguard training on the cliffs just past the old Post Office radio station. Suspended half way down the cliffs a trainee was watched by an even more precarious and brave soul who leant out from the top of the cliff secured only by a rope. 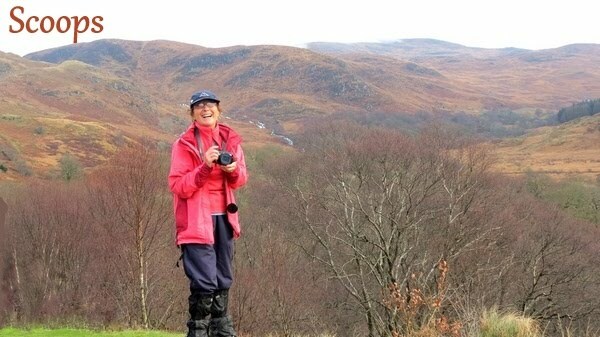 The path was still icy in places but the views were glorious as the ramblers passed by Sandeel Bay and the Dupping Cave where the waterfall splashed over the rocks before the water made its way quietly to the sea. 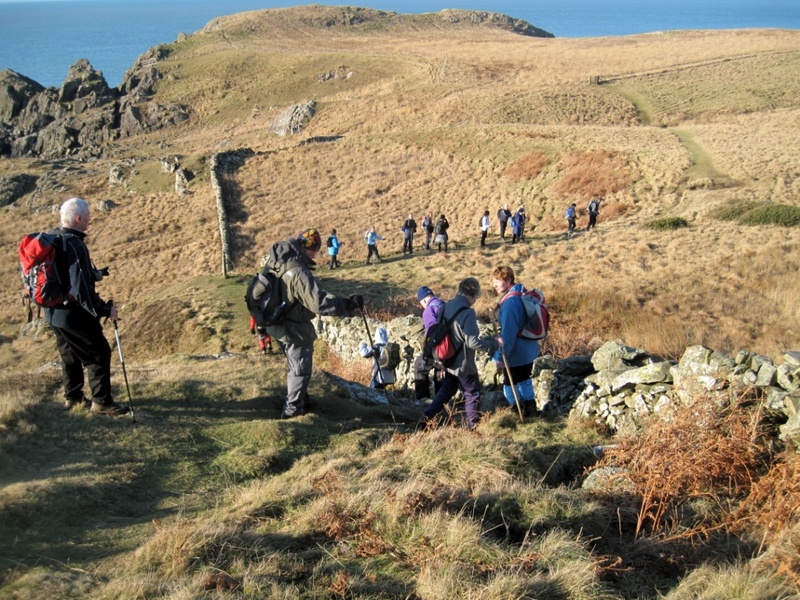 The day had brought many walkers out and it was heartening to see the path so well used. The next bay, Laird’s Bay, holds the terminus for a submarine telephone cable which was first laid in the 1850s. The white painted Victorian hut which marks the spot is at the end of a track leading up Dunskey glen but the Southern Upland way continued along the beach and up a steep chained path once more to the cliffs. It was a pleasant walk from here to the lighthouse at Killantringan, along grassy slopes and in and out of gullies to the last rise overlooking Black Head and the little remaining of the wreckage of Craigantlet, a Cypriot coaster which sank here in 1982. Along past the lighthouse, lunch was taken in a sheltered gully with views of Killantringan sands and Knock house on the bluff above. Taking the walkers away from this welcome rest the road now led upwards and inland to gradually gain a view of the windmills on the moors. The path skirts around the windfarm, ever upwards, passing a large standing stone on the corner where a minor road departs from the A764, and eventually the tarmac is left for a softer way underfoot. Along this moorland path a pause was taken to inspect a kist, containing tokens of the ‘New Hoard’. These tokens are to be collected all along the Southern Upland Way, each kist containing coins designed by young artists – in this case the waymerk sculptor was Alice Mitchell, poet. 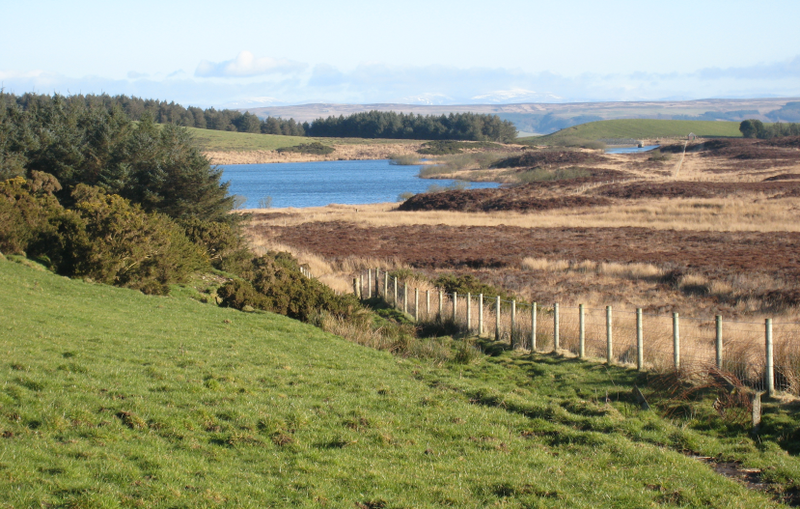 The high point of the moors is the viewpoint on Mulloch Hill where a splendid panorama in all directions gives views of Ireland, Kintyre, Ailsa Craig and Arran , Cairnryan and the Merrick , with nearer views of Knockquasson Reservoir, the next objective. From here the walkers were told it was all downhill to Stranraer – but it seemed to some that the way to Greenfield and the old piggeries at Hillside contained quite a few uphill sections. However, Glebe cemetery was soon in view and Stranraer, still looking like a picture postcard in the bright afternoon sunshine, welcomed the company back – for some the added incentive of scones at Stir It tea room helped to quicken the pace. Eight of us went in for drinks and cakes (there were scones left even though it was about 4pm!). We moved tables together and Mary, Cath, Marilyn, Duncan, Irene, Ken, Audrey and I had a jolly time together. We moved all the tables back afterwards despite Beth saying we did not need to do so.